Strength and convenience in one overpack. High density polyethylene drums accept Packaging Group I, II or III products, permit shipping damaged or leaking drums of even the most hazardous materials. Also approved by IMO, ICAO, and IATA for sea and air transport. 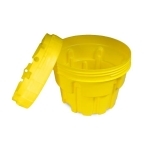 No tools needed to open or close, ideal for rapid spill or leak response. 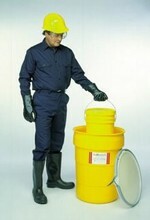 95-gallon drum has twist-on cover, smaller sizes have convenient leverlock ring closure. All styles are nestable for reduced transportation cost.